As part of the University of Missouri System policy on conflicts of interest located in the Collected Rules & Regulations Chapter 330.015, the University requires that members of the UMKC research community complete an annual disclosure to disclose any financial or personal interest that is an actual or possible conflict of interest. 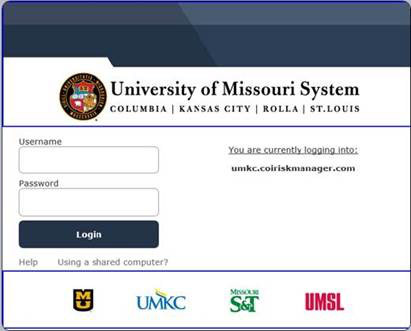 UMKC uses the Osprey system to track and submit annual disclosures for grant investigators. First, request the campus Office of Research Services (ORS) set-up an Osprey account for you. 1. For Osprey accounts set-up with UMKC email. Go to: https://umkc.coiriskmanager.com and complete your annual University financial disclosure. Use your University sign-on and password. The screen = like the below. Login with the user name provided when your account was set up.